Sky showed this game with studio pundits Souness and Defoe. They barely discussed the forthcoming match, preferring to talk about Silva's sacking by Watford earlier in the day. Sickness (Long, Lloris and Eriksen) and injury (Yoshida) meant both sides made changes. Lemina returned for Saints with Davies dropping to the bench. On Spurs bench was former Saint Paulo Gazzaniga. Harry Kane was seeking 2 goals to complete 100 in the PL. It looked a vile afternoon and, for once, I did not regret not being there. Tyler and GNev did the commentary with the latter suggesting it was a "tall order" for Saints to get anything. He clearly wasn't aware I was writing this report: this season I only do draws! Spurs wore their blue kit and Saints kicked off towards the Northam. Inside 20s, Gabbi had tested Vorm with a shot from outside the box and Saints dominated the early minutes. When Spurs finally mustered an attack, saints cleared the danger. Saints might have scored following a fine low cross from Tadić on the left. Gabbi missed the ball completely but, as PEH closed in, Vorm bravely dived at his feet to smother the ball. GNev reckoned a more seasoned goal-scorer might have got there before the keeper. Spurs back four were playing a high line and in our next attack at least four of ours were caught offside. On 8m JWP cut into the middle but his shot went well wide. Then Spurs enjoyed a period of possession winning a corner and penning Saints back. Hoedt eventually cleared the danger and Gabbi played JWP in on the right. His cross went long but was collected by Tadić who hit another fine low cross which just eluded PEH. Spurs then won another brace of corners but eventually put the ball behind for a goal kick. Building from the back Saints found Tadić at inside left. Bertie came bombing past him an the Serb fed a lovely pass inside Aurier for the left back to chase. Without breaking stride, Bertie drove his pass low and hard into the box. The back-tracking Sanchez knew Gabbi was somewhere behind him but, in attempting to cut out the cross, the Colombian merely toe-ended it into his own goal off the post. 15m gone – 1-0 Saints. Spurs went straight up the other end to make amends. First a Davies corner fell to Dier whose low drive cannoned off the post before Tadic turned it out. From Davies's next attempt, Harry Kane rose above our statuesque defence and headed home from 4 yards. 18m gone – 1-1 already. 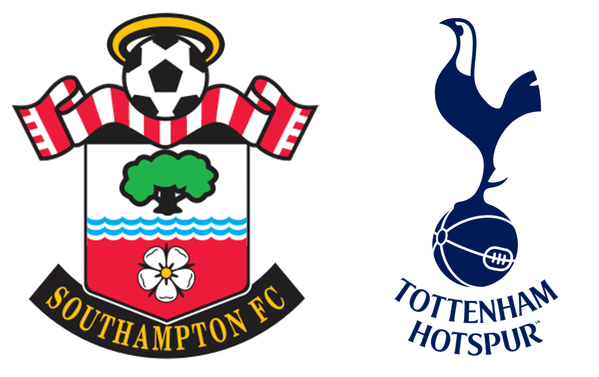 Spurs had the scent of blood and Saints did well to survive the next few minutes without conceding again. Stephens made a crucial clearance when it seemed Alli would score. We even managed to push Spurs back and won a pair of corners up the other end. The second was cleared by Vorm's punch setting up another period of Spurs pressure. Sanchez's foul on Gabbi gave Saints the chance to move forward with the ball arriving wide right with Cedric. His cross was too deep but Tadić retrieved it to set up Lemina but his shot sailed high over the bar. On 29m Tadić and Bertie again combined down our left but smarter Spurs defending saw the ball roll out for a goal kick. Spurs then enjoyed their best period of the first half, moving the ball forward with greater urgency. They might have taken the lead when Davies's driven cross was turned just beyond the back post by Sissoko. The rain continued to pour down and proceedings got a bit heated when afters between JWP and Verthongen almost developed into a brawl. Then a crude foul by Dembele on PEH gave JWP the chance to launch the ball into the Spurs box. His lovely free kick landed right on the head of Jack Stephens but, instead of bulging the net, his header curled agonisingly past the post: GNev thought he had his eyes closed when he met the ball! Dembele regularly continued to commit fouls without being booked and both keepers were kept busy: McCarthy by Dier on 39m and Vorm by Lemina on 41m. With half-time approaching the game was evenly contested but Saints were pleased to see Hoedt hook the ball clear as Kane moved in for that 100th PL goal. HT = 1-1. Sky showed highlights of the halftime sprint competition and some of the smaller kids were clearly not enjoying the conditions out there. Spurs kicked off and it was clear their manager had "inspired them" during the interval as they played with greater intensity. Son had been moved to a more central possession and he soon got a low shot on target – which was hacked away by McCarthy's left boot. Then Stephens was booked for a lazy challenge on Kane. Saints quickly regained possession and broke away. JWP unleashed a long-range effort that Drew another save from Vorm. Saints were playing some decent stuff but progress was often slowed by Dembele's fouls. Lemina was off the field briefly but returned after treatment then Sissoko was booked for fouling Bertie. On 60m Romeu was booked for a particularly satisfying foul on Alli. Spurs then enjoyed further pressure and won their 7th corner. This was cleared but Davies then broke down the left and sought Kane, who miskicked allowing Saints to clear. Their advance was halted when Gabbi was caught offside. At the other end, Saints lost possession but Alli shot wide. During the break in play Boufal replaced PEH. Then Saints moved forward and found Gabbi. He controlled the ball before shooting and forcing Vorm into another save. Spurs got forward with Kane's effort blocked for a corner. The home crowd cheered ecstatically when McCarthy came to collect the cross. Then Alli drove forward but was seen off before Vertonghen shot wide of our goal. On 70m Lamela replaced Son. 2 minutes later Trippier came on for the limping Aurier and his first contribution was a foul on Boufal. Play became disjointed; perhaps the conditions were catching up with both teams. At last, Dembele received a long-overdue booking but Spurs cleared JWP's free kick. Moments later Trippier fouled Boufal and was also carded. Spurs cleared that free kick too. On 79m Davis was on for Lemina. Then, Alli was flagged offside running beyond our back line before we witnessed a genuine debut. On 82m Saints brought on Irish youngster Michael O'Bafemi for Gabbiadini. The scrappy play continued but Spurs nearly grabbed a late lead when the ball reached Lamela at the near post. He briefly delayed his shot before stabbing the ball wide. The final change, on 85m, saw Big Vic replace Dembele. Then Saints created two great chances of their own. First JWP set up Tadić to hit a super cross towards Obafemi. The youngster tried to hit the ball with his right foot as it came across his body, completely missing it. The poor lad will have nightmares about that until he finally sticks one away for the 1st XI. Within 2 minutes Tadić supplied another great cross to Boufal. It had to be struck first time but he took a touch and was blocked. Even GNev decided Saints deserved a winner but it was Spurs who got the next clear chance. First Lamela won a corner which Saints cleared but, in the 90th minute, Spurs regained possession. The ball was worked right to left across the edge of our box with the ball arriving at the feet of Kane. I've spent the last few seasons watching him stick such chances away but, for once, the football gods were smiling on SFC. Kane dragged his left footed shot across the goal and beyond the far post! 5 added minutes were played and both sets of players looked shattered. Midway through added time, Big Vic took a speculative, long range shot that sailed well wide. That was the last significant and a match we had seemed destined to lose was drawn. Both sides had enough chances to win it but perhaps the conditions ensured a 1-1 result. Saturday's results had pushed Saints into the relegation zone and a single point was not enough to lift us out. The performance however was much better. Unlike previous collapses, when Spurs equalised, Saints dug in and stayed in the game. With more adroit finishing we may even have won it. GNev said JWP and the BBC said Bertie. I'm going for another – Dusan Tadić. If Guido is only half decent he'd have got at least a brace from the chances Tadić set up on Sunday: best performance the Serb has given in a long time.